Here is a description of doing the West Highland Way as a run! I did it with my other half, over 6 days, finishing day 6 on my 40th birthday. He’d done bits of it about 20 years ago, but had cheated and caught the bus one day, so had always wanted to do it again! We’d bought the little guide book about 10 years ago, which turned out to be amusing in itself reading it – it highlighted in bold where you might find the internet – and for the weather forecast you had to phone a premium rate number!!! How things have changed! First day West Highland Way: Milngavie to Balmaha – went OK. We’d spent the day before ‘carb loading’ at some of our favourite cafés in Glasgow, and the night in the Premier Travel Inn in Milngavie. We met our baggage carrying man Fraser early doors and enjoyed a good chat with him, before using the cash point for the last time. Then cracked on! Glad to get underway, through woodland and then disused railway line. We had actually done part of this section two years ago in the other direction, so hardly any map reading was required. And actually the waymarking on the West Highland Way is generally great everywhere! After near Drymen it started raining, at first we couldn’t decide whether to put waterproofs on or not – but instinct came in and we were duly grateful – as soon it was teeming down. Then one last push over Conic Hill – the first bit of real moorland we had seen, and I admit to walking some of this section. On the last mile we overtook what sounded like a young Italian man, who was impressed to see runners but shouted out he thought we were mad! Then we dropped down to Balmaha for chips and beer in a pub garden, in the sun, on the bonnie bonnie banks of Loch Lomond! Spent the night at the Balmaha bunkhouse, because our stuff was all wet we soon made our bedroom smell like a mouldy laundry! Made ourselves vegan burgers in the bunkhouse kitchen – yum. Second day West Highland Way: Balmaha to Inversnaid: we had been warned about tree roots and stones on a difficult loch side section, but that turned out not to be today. No trip-ups on any trees at the edge of the loch and up through ancient oak / aspen / birch woodland. Actually quite a lot of today was in trees and woodland – some good forest paths, gently undulating, and quite a good surface to run on – but not great for photos! We had a coffee at the Rowardennan Hotel, when the Italian man passed us again, waving out a cheery hello! Saw a tiny frog less than an inch long cross the path in front of me! We stopped our run for today at the loch side hotel and treated ourselves to more chips (salt cravings?!). We stayed at Inversnaid bunkhouse, which is a way uphill from there – walking it was a real leg stretcher after the running! Here we had a private double room booked, so we lounged in bed and read the paper in the afternoon, explored a bit before tea, then enjoyed the vegan meal that the bunkhouse cooked for us. There was a self-catering kitchen there, but the home cooked food looked better! bracken makes a microclimate. Finally up into some open moorland areas with a welcome breeze, I don’t mind about the pylons, as the drover’s road was a good surface! We met our Italian friend again, and this time stopped for a chat – he is a referee in Italy and had not come across people doing long-distance trail running before! Then, onwards – the route is close / parallel to a main road, which was eerily quiet. At the half way point (a deer fence!) we decided to make a detour for ice pops to Crianlarich, before heading on to our next base, our glamping wigwam, only to find we’d beaten the bags here! We discovered that was because there had been an accident on that eerily quiet road, so our bags and Fraser were stuck in the tail backs! We sat looking at our day-old socks and our small day packs, hoping we could eek everything out for tomorrow, in case our bags didn’t arrive at all. The wigwam place lent us a pair of towels so we could shower at least. Then the bags arrived and they even brought them up the hill to us in a land rover! We chose here so we could be self catering and so we made up a lovely meal with more of our vegan rations from the bags. Wild rabbits around our cabin in the evening, fab memories! West Highland Way, day 4 – Strathfillan to Inveroran. A short early blast to Tyndrum where we treated ourselves to tea / coffee – legs feeling stiff but that soon wears off. Then a great stretch on old military road – fab path surface, views, gentle pootle downhill. Looking back on the whole trip, this section was one of my favourites. Felt we could go on like this for miles! Reached Bridge of Orchy for more coffees at midday, then only 3 miles on to tonight’s base! Which was the Inveroran Hotel. We beat the bags again! As we sat with a drink in the hotel bar, chatting to a man from Ireland who was just wondering how far he’d go before camping, Fraser arrived with our bags – he enjoyed another good chat, I don’t think he is used to seeing his customers during their trip! The accommodation sadly has seen better days, just catering for carnivores really, so we showered and WALKED BACK (would you believe) 3 miles to enjoy wifi and vegan side dishes at the Bridge of Orchy. Let’s hope we can check out any time we like tomorrow AND leave! West Highland Way, day 5 – Inveroran to Kinlochlevan. A nice gentle climb up to moorland where we looked up and around on the off chance of seeing eagles. As we ran along, we passed two walkers with huge back-packs pondering along, and wearing hats with mosquito nets over them. I heard one say to the other, “that is the way to do it!” and indeed, when running along you aren’t bothered by the midge one bit. However, don’t stop long to take photos! Plus the joys of not carrying tons of luggage are worth writing home about. Today we had views to Rannoch Moor and the route to ourselves, apart from a couple of people who looked like they had camped wild. At one point I thought I might have jarred my right ankle (this is an ankle I sprained about 8 years ago and it has always been weird since) – and I thought to myself, “must go steady, because one injury now would be game over for finishing the route.” We dropped down to Glencoe for a coffee at the ski centre, feeling like we were making great progress. Then off again, along the glen for a few miles (we met the Irish man again, who’d had a great time the night before photographing the sunset in Glencoe – this happens quite a lot of the route, you see the same people a number of times) before the “devil’s suitcase” (actually devil’s staircase but we kept saying it wrong – eventually I said devil’s wardrobe and my other half didn’t bat an eyelid – I wonder what the devil would put in wardrobe, or a suitcase!) – a steep climb on loose stones – admit to walking this bit on and off. The combination of the gradient and what felt like being on someone’s gravel drive made it impossible to run. Then a long descent to Kinlochlevan – we got here early afternoon and treated ourselves to food from the co-op, and had a lovely chat with a Canadian couple on a bench outside. Lovely B&B tonight (beat the bags here again!) with a bath!! After which we explored the town – a really nice place with really interesting history from aluminium smelting and dam building just 100 years ago (we went to the heritage centre). We started to feel that the end of our goal was in sight! West Highland Way day 6 – Kinlochlevan to “The Fort”. Beat the bags again! Open ground and a bit of rain to start with. Good highland landscapes. When it stopped raining it was nice to put the hood down as otherwise you just hear yourself! Views of Ben Nevis on the way down steepish forest tracks. Coming out of the forest and into civilisation I caught a glimpse of my shadow and realised the trail running looks quite slow! So I dug deep and tried to run at my normal speed for the glory mile. This last part through the town a real slog! – they have moved the end point from outside of the town (where you can get a free certificate) to the other end of the high street, seemingly to ensure you pass every pound shop, tat shop and mini Tescos on the way. Anyway, we got to the ‘new’ end point (a bench with a walker statue) before making our way back to the luxury hotel we’d booked to celebrate my birthday in! Had a sauna that afternoon and felt like we had new legs afterwards and could have done it all again! Then, that evening, we went for birthday curry, then we met our Irish friend in a bar for a drink together. He was going to do Ben Nevis itself the next day, then a week on Skye. We were impressed – quite an active fortnight, for camping too! He is an artist and photographer – and something he said stuck with me … he said he’d often looked forwards and looked back on the path and never felt like he’d been on his own. All the people camping on the route were like a caterpillar, moving forward at roughly the same speed. But as runners, we had OFTEN felt like we were on our own, as we had overtaken the caterpillar each morning, got up in the open sections, before dropping down again. 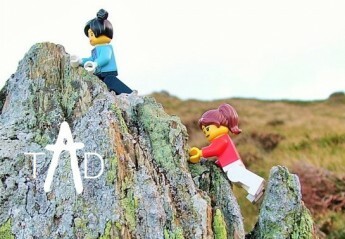 The Adventure Declaration would love to hear your stories- whether it’s about your favourite adventure item, or sharing one of your adventures, all adventure stories are welcome. Click here to find out how to get in touch. ← Adventure socks, shoes or sunglasses?